It’s usually hot out at this time of year, but summer only has a smaller part to play in this week’s post. Today we discuss your dog’s hot spots. Hot spots can happen to your pet at any time of year, including summer, all they need is an irritant to get them started. Also known as pyrotramatic dermatitis, or worse yet moist dermatitis, hot spots are a bacterial infection that present on the skin of your dog as an oozing (and moist) reddened area. Those whose pets have had them know that they can be quite itchy and painful for them, sometimes resulting even in hair loss in the region, and also produce a terrible odour. Many allergies as well as pests and parasites become rampant in the summer season, which can lead to an increase in prevalence but hot spots can occur any season. As they are a bacterial infection, scratching, licking and biting only make matters worse. If your pet gets into this habit then there are ways to stop this adverse behaviour. Hot spots can be treated at home, but do require a trip to your veterinarian to acquire the tools you will need to heal them. Prescription sprays and creams to promote healing and antibiotics are often required to promote healthy healing. The fur around the wound will be clipped to expose it to the air to aid in drying the moisture. Before the application of a prescription topical steroid treatment, the area must first be cleaned with an astringent or antiseptic and dried. 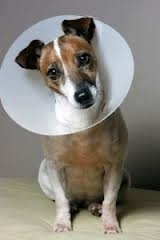 In the movie ‘Up’, it was known as the “Cone Of Shame”, but in the case of hot spots it is very necessary to prevent your dog from disrupting the healing process by licking and biting. As a parent, it is up to you to monitor the wound and ensure your dog is allowing it to heal. Hot spots can spread very quickly if left untreated or under-attended, diligence is important. If you suspect that your dog is developing a hot spot, see your veterinarian today to begin the healing your dog requires to be happy and irritation-free.